William Fugar has appeared and participated in all stages of litigation at all levels of the Court Structure. He has also participated in conciliation and arbitration. William Fugar is on the list of Panel of Arbitrators at the Shenzhen Court of International Arbitration “SCIA” (also known as the “Shenzhen Arbitration Commission” and “South China International Economic and Trade Arbitration Commission”). SCIA was established in 1983 at the start of China’s reform and opening-up and it’s the first arbitration institution in the Guangdong-Hong Kong-Macao Greater Bay Area, as well as the first arbitration institution in China that implements the statutory body governance mechanism. The SCIA has established a corporate governance structure with its International Council as the core, as well as an International Panel of Arbitrators comprising more than 40% overseas Arbitrators. William Fugar will be engaged as an Arbitrator of the Shenzhen Court of International Arbitration (Shenzhen Arbitration Commission) for a term of three (3) years from 21 February 2019 to 20 February 2022. He has specialisation in Corporate Law Practice, Banking, Investment, Commercial Law, Mining Law, International Business Transactions, Mercantile and Shipping Law, Intellectual Property, Energy and Natural Resources Law. He is also a Notary Public. 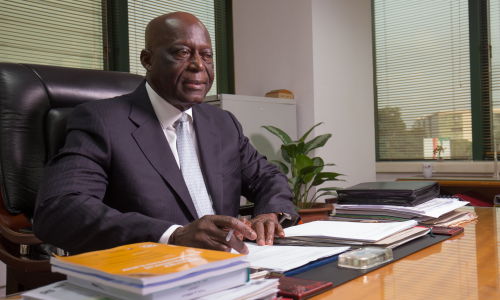 Since 1973 he has been actively involved in legal practice in Ghana. He has appeared and participated in all stages of litigation at all levels of the Court Structure. He has also participated in conciliation and arbitration. In 1986, advised in the setting up of Teberebie Goldfields Limited (TGL) at the time the second largest gold mining company in Ghana and acted for TGL legally and advised on matters related to the financing of its projects and for several years was a Director of TGL until 1998 when the company was sold to Ashanti Goldfields Company Limited. Advised Merrill Lynch International and Hong Kong Shanghai Banking Corporation (HSBC) (Managers) in Exchangeable Bonds issued by the Government of Ghana. Advised ICI (UK) Limited in its joint venture with Ashanti Goldfields Limited to set up ICI Explosives (Ghana) Limited now African Explosives (Ghana) Limited. Drafted the Regulations under which the company was incorporated. Drafted and/or reviewed various finance agreements under which loans were advanced for setting up the explosives factory. Advised ABU, a German Civil Engineering Company in the dispute it had with Ghana Highway Authority over part of its road construction work. Was a member of the Conciliation Committee set up to resolve the dispute. Advised Pioneer Goldfields Limited, an external company registered in Jersey, Channel Islands, on its proposed listing of its shares on the London and Ghana Stock Exchanges. Acted as the Ghanaian Counsel to Goldman Sachs on the listing of Ashanti Goldfields Limited on the New York Stock Exchange. Ghanaian counsel to N M Rothschild in its financing of Goldfields Ghana Limited, Tarkwa project and Ashanti Goldfields (Bibiani) Company Limited. Provided various legal services in the divestiture of Ashanti Goldfields Limited, State Construction Company Limited (SCC), Gliksten (West Africa) Limited, Ghana National Trading Corporation (GNTC) and Abosso Glass Company Limited. Advised the Commonwealth Development Corporation in its financing of the thermal project to generate electricity by the Volta River Authority at Aboadze in Ghana. Advised Satellite Goldfields Limited, a major gold producing company on its set up and borrowing from a group of international lending banks to finance its operations. Advised Unatrac in its acquisition and purchase of shares in Tractor and Equipment Ghana Limited from Unilever. Together with S.G.S. Environmental Division reviewed all laws relating to the environment and mining with the view to updating them and advising on their practicability. Together with the London legal firm of Nabarro Nathanson, carried out a comprehensive review of the Ghanaian Administrative law and procedures for the Ministry of Justice under a programme sponsored by the World Bank. Has advised El Paso Energy Inc in its proposed joint venture with the Ghana National Petroleum Company to develop the Tano gas field and build power badges for the production of electricity in the Western Region. Advised South Trust Bank of Alabama and NatWest Bank of New York both of USA on its funding of a major mechanised rice farming project in the Southern part of Ghana. restructuring of its entire corporate set up with particular reference to Ghanaian law. Advised Credit Suisse First Boston, Hong Kong Shanghai Banking Corp. (HSBC), Merrill Lynch and others on Ghanaian law. Has advised HSBC/Midland Bank on the financing of the Ghana Civil Aviation Authority’s expansion of the Kotoka Airport Runway Project. Acted as Ghanaian counsel to Standard Chartered Plc in relation to the financing of Tema Oil Refinery (TOR) Limited’s sale of oil products. Advised Marathon Power of the US on its joint venture with the Volta River Authority to develop a thermal plant to generate and distribute electric power. Advised and served as a member of a consortium of consultants headed by Stone and Webster Management Consultants Inc., to advise the Ghana Government on private sector participation in the urban and water distribution and development in Ghana – a World Bank sponsored project. (b) Goldfields Ghana Limited’s mine at Tarkwa. Advised Siebe Limited, a British Company, in the divestiture of its interest in Holman Brothers Ghana Limited. In conjunction with Norton Rose, a legal firm in the UK, advised African Lakes Corporation PLC on its proposed acquisition of Tri-Continental Limited and its interests in Micro Warehouse Limited, a company registered in Ghana. Provided advisory services for international financial institutions including International Finance Corporation (IFC) and African Development Bank (ADB). Currently together with major law firms in the UK advising lenders for the financing of Kosmos’s oil operations in the Jubilee block. Was a Lecturer and Examiner for examinations organised by the Institute of Bankers, Institute of Chartered Accountants and the Chartered Institute of Secretaries. Established the legal firm of Fugar & Company a one-man legal firm. Now employing over fifteen (15) lawyers and ten (10) paralegals. Specialisation in Corporate Law Practice, Banking, Investment, Commercial Law, Mining Law, International Business Transactions, Mercantile and Shipping Law, Intellectual Property, Energy and Natural Resources Law; Notary Public. Legal Adviser to a number of companies including Neoplan Ghana Limited, Panalpina (Ghana) Limited, Unilever (Ghana) Limited, Mantrac (Ghana) Limited, Japan Embassy, Japan International Corporation Agency (JICA), Poly Group of Companies, GT Bank Ghana Ltd, Access Bank UBA Ltd, Anadarko WCT Company Ltd, Astra-Zeneca, Cargill Ghana Ltd, Toyota Ghana Ltd, Olam Cocoa, ORICA Ghana ltd, Plan Ghana, First Atlantic Merchant Bank Ltd, New York University (NYU), Oxfam. Directorships – Fugar & Company, Quintiles West Africa Ltd, Dominion Oilfields Services Ltd, Accenture Ghana Ltd., Hewlett Packard Gh. Ltd.